Luck ran out on an armed robbery suspect who was confronted by a mother and daughter, as he attempted to rob them at their Oklahoma liquor store. 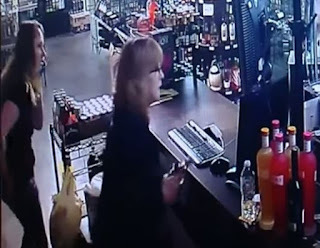 According to Tulsa World, the failed operation happened on Thursday night at the Forest Acres Liquor in Tulsa, where Tina Ring, 53, and her daughter Ashley Lee, 30, were working. Surveillance video obtained by the media outlet, captured the scary moment the suspect walked into the liquor store and pointed a weapon at Lee, who was behind the counter. He had a brief operation behind the register section, before disappearing from the video. Tina and her daughter Lee luckily reached for their guns and opened fire a number of times when the suspect reappeared. This forced the suspect to retreat from the building. Soon after, the suspect reappeared again after getting injured from the gunshots clash, and gets into a physical fight with Ring over her weapon. But her daughter fired at the thief for a second time, before escaping with her mother from the building. “I didn’t want him to hurt my daughter, that was my main thought. All I was thinking was 'Just give him the money and go,' and next thing I know, I see him back in my face,"
"I think I'm still in shock. I don’t think I have really processed everything yet," she added. According to the outlet, the suspected robber was identified as Tyrone Lee, a man in his thirties, citing Sgt. Brandon Watkins of the Tulsa Police Department’s robbery unit. The suspect is not related to the store employee, Ashley, the outlet said.